Master negotiator Roger Dawson turns his attention to the person on the other side of the desk�the salesperson who�s trying to close a deal with the most favorable terms. The goal of most negotiations is to create a win-win situation. Imagine if you could win every negotiation and leave the other person feeling like he or she has won too? This book teaches you how to be the power sales negotiator who can do exactly that. You will always come away from the negotiating table knowing that you have won and that you have improved your relationship with your buyer. Roger Dawson gives salespeople an arsenal of tools that can be implemented easily and immediately. 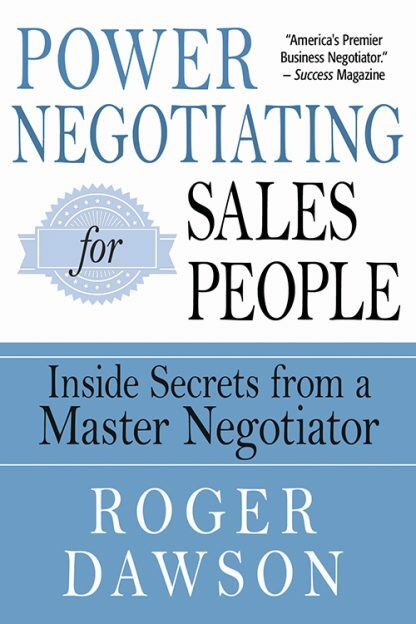 Power Negotiating for Salespeople is not a dull, dry treatise full theory. Nor is it a handbook of tricks and scams meant to manipulate others. It is the most complete book ever written specifically for salespeople about the process of negotiation and will enable any salesperson to take a quantum leap in sales.